There are some games that should be kept out of the hands of people with addictive personalities. For me, Card Fighters Clash was one. Kingdom of Loathing, for a time, was another. And don’t get me started on Animal Crossing: Wild World – everything UK:Resistance say about the game is true (and if anything an understatement). Given this history I daren’t even approach World of Warcraft. The rewards offered by these games, shorn of context or emotional investment, are not immediately apparent to the outside observer. A few games take this a step further, leaving the players themselves without an adequate explanation as to why they’re drawn into the game. Sometimes it’s enough to see a number get bigger. A case in point: Restaurant City, the latest game from Flash-games-for-social-networks supremos Playfish. This is a game that offers very little in the way of traditional gameplay, but I still can’t stop going back to it. As with Playfish’s earlier game Pet Society, Restaurant City take a lot of cues from Animal Crossing. You have a restaurant which you can furnish and decorate. You can hire staff (names are taken from your Facebook friend list, although oddly ‘hiring’ someone else who also has the app installed doesn’t have any impact on either party’s game) to cook and serve food to a constant stream of customers. Thankfully the running of the restaurant (while obviously modeled after Diner Dash and its countless clones) is fully automated, requiring the player do no more than make sure that the furniture, doors and stoves are positioned for maximum efficiency. The game world is persistent, so your restaurant will continue to earn money and experience without manual intervention, as long as the staff are periodically fed or rested. The restaurant’s menu is chosen from a set of recipes (similar to the fossil, fish and insect collections in AC:WW) which are unlocked and levelled up by obtaining their required ingredients. Ingredients are the ultimate currency of the game. New ingredients can only be obtained by visiting friends’ restaurants (first time only), trading with other players, or answering a daily trivia question correctly. This brings us to the main shortcoming of the game in its current (beta) state. Unlocking recipes for new dishes has no gameplay effect (a ‘level zero’ version of any dish always sells for $2 and gains 1 XP). It’s only by leveling up recipes (spending ingredients on them repeatedly) that the amount of XP awarded increases. (So for example, if I learn the dish Roast Beef, I would need to spend 1 x BEEF, 1 x CARROT and 1 x SALAD to unlock it, and then the same again to level it up each time.) Amassing the necessary items might take weeks, and still depend on a great deal of luck (especially as some ingredients are much rarer than others). 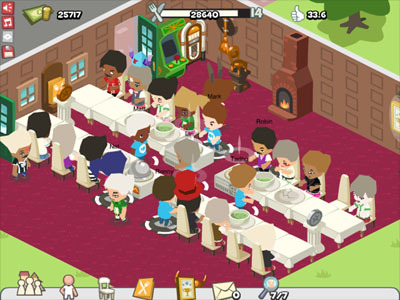 If you’re trying to ‘power play’ the game, gaining money and levels as quickly as possible to be able to afford the expensive high level items, the ingredient system places a massive emphasis on inviting friends to join the game (to get the bonus ingredients for visiting their restaurants for the first time, and to enlarge the pool of people to trade with). While this is obviously intended to make the game propogate virally, it jars with the established etiquette on Facebook, at least as I interpret it. (I suppose things might be different on other social networks, for instance the more youth-oriented Bebo.) There’s no option to purchase ingredients for (real or in-game) money instead. While I can’t profess to have done any formal research into users behaviour on social networks, it instinctively feels to me that the game would have a better chance of spreading if it posted messages into players’ feeds, piquing their friends’ interest in that way rather than cajoling players into sending out invite spam. I only responded to the invite I received because I recognised Playfish as a reputable outfit and because the theme and the Play By Mail-inspired mechanics were sufficiently intriguing. The only other criticism I have of the game at this stage is that it does feel a bit too much like a single-player game that has been thrust into a social arena. The options for interaction between players (either in ways that affect the game, or ‘playful’ ways to elicit a response) are fairly limited. That said, the game is already highly addictive, and if that translates into commercial success we will no doubt see new features added on a regular basis.